What are the Different Types of Cabinets? Base cabinets are the beginning blueprint of a floor plan in your kitchen and take the burden of everyday activities. They are mounted to the floor and support your countertops and everything else that is on top. Most kitchen islands are made of base cabinets that are combined and installed on site. Wall cabinets got their name because they are mounted to the wall. The design flexibility is almost endless, you can choose different heights, custom depth, multiple widths, and different door options, and really the possibilities are endless. You can combine base and wall cabinets to make an accent wall that stores cookware and cookbooks or whatever else you’d need. Tall cabinets go from your floor to ceiling. Tall cabinets are also sometimes called a pantry and can provide as much as 4 cubic feet or even more for storage. From small to big appliances, a pantry can store a lot, and tall utility cabinets can be made to fit large appliances. Wrucks Carpet One Floor & Home in Wasilla, AK is your local home design center, so we are happy to offer a selection of quality home products such as cabinets. Cabinets are extremely popular in home settings because they can add both style and function to any room. They, for example, offer wood’s natural appearance and character, and they also can provide easy access to household items and appliances. Cabinets, as you can imagine, are most popular in kitchens and bathrooms. Both kitchen cabinets and bathroom cabinets are available in wood or synthetic constructions, and for the most part, they are all relatively similar. Kitchen cabinets, however, tend to be more expansive because kitchen settings are usually larger than bathroom settings. As part of our cabinet selection, we offer Homecrest and Medallion. Both Homecrest and Medallion offer a great selection of high-quality cabinets, so we are pleased to offer the full lines. Be sure to click on the links below to learn more. Not only do we have quality cabinets in our showroom; we also offer design and installation services. Our experts, for example, will help you choose the best cabinets for your particular setting, and we’ll take price, style, and function into consideration. And, after you choose your cabinets, we’ll make sure that they are built and installed properly. We can handle any accommodations! Looking to take on a larger project in your kitchen or bathroom? Be sure to learn about our available countertop options. Kitchen cabinets are an important part of your overall kitchen design. Choosing the right type of cabinets can help you to organize your home and life. You’ll want to choose cabinets that maximize your functional storage space. Cabinets can account for up to 50% of your kitchen budget, so you’ll want to make sure you choose an option with quality construction. You’ll also want to make sure you love your cabinets, from the door all the way down to the hardware. Cabinets feature many different styles ranging from casual, contemporary, rustic, traditional, and transitional. Depending on the décor of your home there are many different pre-made cabinets that feature classic styles as well as new trends. You can even design your cabinets around your home décor to ensure they are a perfect match for your kitchen. Although we do not offer entirely custom cabinetry, we do offer stock cabinets and semi-custom cabinets. You can easily refresh your kitchen with stock cabinetry. They are made in common cabinet sizes, and are available in a limited variety of door styles, colors and finishes. 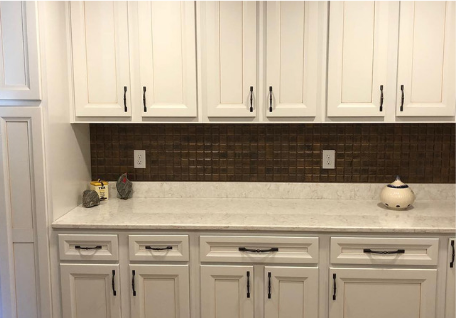 Semi-custom cabinets are available come in more styles which means you can give your kitchen a more personalized look without breaking the budget on custom cabinets. Built to order and available at cabinet dealers, semi-custom cabinets are generally delivered within four-to-eight weeks. You can choose from a wide selection of finishes, stains, paints, glazes and specialty finishing techniques such as distressing. They are also available with features such as roll out shelves, door racks and organization inserts, and can be embellished with crown molding, cabinet legs and feet, and a range of hardware choices to create a unique look. Updating the cabinets in your home is made easy with us. Simple give us a call or stop by the store to schedule a free in-store appointment. Meet with our experienced staff to discuss your goals, budget and style. Then a certified installer will come to your home to perform on-site analysis. Our sales professionals will measure the space, assist with design, ordering the product and arrange for installation. They also stand behind the product, addressing any challenges that may arise right then, right now. This degree of attentiveness can only be accomplished at a local level.